Are you running out of time? Tick-tock, tick-tock! "That is how I often feel. There are so many things I want to create, develop, and okay...finish! But the time, is there enough? 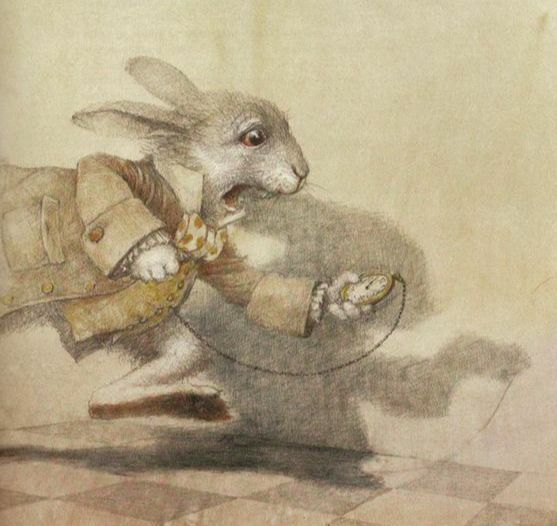 This lovely rabbit is from the amazing Robert Ingpen (who illustrated my story, If you Wish) . He is one of my favorite White Rabbits from Wonderland and I hope will keep reminding me to not give up and keep on working and keep my eye on the time, tick-tock. I have found another way to keep myself motivated. Commit out loud! Let others know what I am working on and sometimes commit to a project in partner with someone else. I am doing both this year and will keep my updates here." Like broadcasts from the radio of old, I want to present stories that children can listen to. Yes, it is, but I am making progress. I have 18 already. Then I have my Hollis and Og series. Hollis is a gnome, and Og (short for Ogwell) is a traveling frog. A little bit of magic, some nature, and a lot of humor and friendship will be in these stories. I know that the recording of them will also take time, but I thought it was important to get the content taken care of first. My desk pixies have wished me luck; I hope you will too! This is a project that I’ve been contemplating for quite some time. The idea was there, I just know how to get off the ground. Finally, I just went ahead and asked composer friend of mine if she was interested in working on it with me. Thank goodness she said yes. I am the slow one, but after I get these two new websites up and running, I will go back to working on new text and lyrics for this musical production. I’m hoping that it will turn out to be something that children would like to see but also that they would like to perform in their schools. That is why asking Cyndee Giebler to work on this with me was a brilliant idea. She is a wonderful musician, a terrific teacher, and someone who knows a lot about school-age children and their music. This won’t be classical music, nor will it be too Disney-esque. We are hoping it will be fun to perform and enjoyable to listen to. Okay, desk pixies, start thinking about that!